Two of my favorite topics of geoconversation are how new subduction zones get started and when in Earth’s history did plate tectonics begin? Both are fascinating geoscientific questions but we seem to be making more progress on the first topic than on the second. The plate tectonic revolution changed our science forever but in the excitement of the late 1960’s when the paradigm shifted, the question of what makes the plates move was neglected. Yes it was mantle convection, but was convection driven by hot deep mantle rising or cold dense lithosphere sinking? Geodynamicists soon began investigating and now they tell us that it is mostly the sinking of dense lithosphere in subduction zones, pulling the plates and moving them. The most important consideration is that hotter asthenospheric mantle is slightly (~1%) less dense than colder overlying lithospheric mantle, so these want to change places. This sometimes happens during detachment and delamination of lithospheric mantle but generally happens by subduction, the end-on sinking of lithosphere beneath asthenosphere. Our modern understanding of what drives the plates shows us that the key to understanding how subduction zones form is by understanding the density and strength of oceanic lithosphere. It also tells us that we should be thinking about lithospheric strength and density when we try to answer the question “When did plate tectonics start on Earth?” Certainly the Archean mantle 2.5 to 3.8 Ga was hotter than is the modern mantle. Consequently, Archean lithosphere would have thinner and more buoyant, and on this basis alone a reasonable person would conclude that plate tectonics must have been more difficult back then. In spite of this, most geoscientists think that plate tectonics was underway in Archean time. Regardless of your opinion on this matter, the question of when did plate tectonics start (WDPTS?) is one of the most important – and exciting – unresolved questions in the history of the solid Earth. I find this to be a particularly interesting question because EVERYONE can get involved: graduate students, undergraduate students, K-12 students, professors, amateurs, the media. We can’t agree on the answer yet so let’s discuss it! The key to answering WDPTS? must be to reconstruct Earth’s tectonic history, using both first-order understanding of how large silicate bodies cool and proper interpretation of the rock record, particularly those mineral and rock assemblages that are diagnostic of plate tectonic records of independent plate motions, subduction and collision. One possibility is that Earth has always had plate tectonics. This follows from a strict interpretation of the Principle of Uniformity, which basically states that “the present is the key to the past”. Following strict Uniformitarianist logic, because we definitely have plate tectonics today, Earth must have always had plate tectonics. But strict adherence to Uniformitarianism is ridiculous, as Stephen Jay Gould pointed out in his first peer-reviewed paper (Gould, 1965). Uniformitarianism is very useful when you are trying to explain how the Earth came to be to a bunch of religious nuts who think the Earth is 6000 years old and that humans and dinosaurs coexisted, but it is not useful when trying to understand Earth’s tectonic history for the simple reason that it inhibits inquiry. Earth is the only known silicate planet that has plate tectonics, so plate tectonics is probably a special way that viscous, rocky planets cool. Once we escape the Uniformitarianist straitjacket, we can see that a hotter early Earth may have cooled in a different way than the present Earth. Certainly we all know that there were different conditions in the Precambrian, which makes up 88% of all geologic time. We know that the interior of the early Earth was much hotter than that of today, for a number of reasons. For example, heat production due to radioactive decay at 4 Ga was ~3x that of today. Other causes of early heating include heat of accretion, the Sun’s T-tauri event (beginning of H fusion), core differentiation, and the Mars-size impact events. How much hotter was the early Earth? We don’t know but we do know that there are vanishingly few rocks from the first 800 Ma of Earth’s history, as expected for a hot early Earth. Earth cooled sufficiently that 3.8 Ga rocks are fairly common (e.g. Greenland, Africa) but still, Earth must have been much hotter in the Archean than it is today. How did a hotter mantle affect our planet’s style of heat loss, i.e. tectonic style? Some conclude that a hotter mantle would have resulted in a greater total length of global spreading ridges, which means smaller plates and faster moving plates. Certainly a hotter Earth would have caused more extensive melting and thicker oceanic crust – komatiitic oceanic crust seems likely. It is also likely the oceanic lithosphere would have been thinner and more depleted and that the underlying asthenosphere would have been hotter. I surmise that Archean lithosphere would have been hotter, thinner, and less dense; it also would have been weaker and more prone to necking and breaking. These characteristics would have made it easier for sufficiently dense Archean lithosphere to trade places with buoyant Archean asthenosphere but this would have made subduction – which requires coherent plates – more difficult. We can (and should) stake out an opinion, but who knows for sure? Each of us should consider what we know about how our planet operates today and mentally explore how the hotter early Earth would have been similar or different than the plate tectonic Earth of today. I discussed some of these issues with an eminent geoscientist, who argued that plate tectonics has always been operating on Earth. I asked him why he thought this and he replied “How else can you generate magmas and deform rocks?” There is no doubt that the Archean Earth witnessed a lot of igneous activity and deformation, maybe more than experienced by the modern Earth, but this does not require plate tectonics. This is vividly demonstrated by the examples of Venus and Mars, which today suffer intense deformation and magmatic activity but without plate tectonics. For me, the most important evidence that Plate Tectonics operated at a given time interval is the preservation of ophiolites, blueschists, and ultra-high pressure (UHP) metamorphic terranes from a given time period somewhere on the globe. 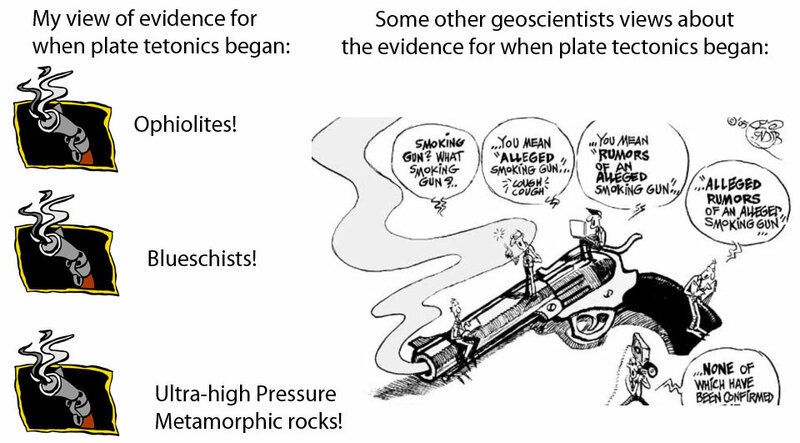 For those unfamiliar with what I call the “Smoking guns”* of Plate Tectonics’ (Fig. 1): ophiolites are fragments of oceanic crust and upper mantle (lithosphere) emplaced on continental crust (where geologists can study them). Ophiolites should have but sometimes lack extensive gabbros or sheeted dike complexes, but at a minimum an ophiolite should include tectonized harzburgitic mantle and pillowed tholeiite. (gem corundum, UHP metamorphic rocks, and passive continental margins. Modified from Stern et al. (in press). Blueschists are fragments of oceanic crust that have been metamorphosed 40-60 km deep in the distinctive high-P, low T environment of a subduction zone. This produces the diagnostic Na-amphibole known as glaucophane. UHP terranes are slivers of continental sediments which have been subducted even deeper than blueschists, to depths of 100 km. Pressures like this are required to produce UHP-diagnostic phases of diamond or a high-P polymorph of SiO2 known as coesite. Both blueschists and UHP terranes require a two way ticket, down to be metamorphosed in a subduction zone, and back to the surface to be greeted by enthusiastic geologists. Excepting a few 1.9 Ga ophiolites, all three ‘smoking guns’ first appear in Neoproterozoic time, less than 1 billion years ago. I am very impressed by the fact that the vast majority of these three primary indicators of plate tectonics are so young, other geoscientists are less impressed (Fig. 2). More details about the nature of these three petrotectonic indicators can be found in Stern (2005) and Stern (2008). left, the views of some/many other geoscientists are on the right. Thanks to Julian Pearce for cartoon on right. WTPTS? does not take up much of my research time but it is fun because it keeps me thinking about all the ways that Earth’s tectonic history can be interrogated. I wonder if there is some type of ore deposit or other rock association that could be used as a new plate tectonic indicator. Eclogites are also potential plate tectonic indicators. One type of eclogite forms when oceanic crust is metamorphosed at 50 km or more deep in a subduction zone but the term also can be used to describe any garnet-pyroxene rock produce by non-plate tectonic processes, for example in the lower continental crust as high-P cumulates or accompanying crustal thickening. Bob Coleman and colleagues wrote an interesting review entitled “Eclogites and Eclogites” that discussed some of these issues (Coleman et al., 1965). Subduction-related eclogites are a particular variety of clinopyroxene-garnet that contain Pyrope (Mg-Al) garnet and omphacite (jadeite-rich garnet). We need some kind of a “discrimination diagram” to distinguish subduction-related eclogites from those of other origins and then we could compile the distribution in time of subduction-related eclogites and use this as an independent petrotectonic indicator to help answer the question WDPTS? A few years ago, Tatsuki Tsujimori and co-authors looked at another subgroup of eclogites which must be subduction-related, those containing lawsonite (Tsujimori et al., 2006). Lawsonite is a hydrous calcium aluminum silicate that is typical of blueschist facies environments, and all known lawsonite-bearing eclogites are Phanerozoic (Fig. 1). Another rock association that needs to be looked into for the purpose of addressing WTPTS? is the distribution of calc-alkaline batholiths through time. Batholiths mark the exhumed roots of magmatic arcs, exposed by a few km of erosion to remove the volcanic cover, and can be expected to persist as distinctive hallmarks of subduction until they are covered up by sediments. How can we recognize subduction-related batholiths in the rock record? We shouldn’t be happy with just a few trace element diagrams as sufficient to identify arc-like igneous rocks. Someone should develop a more robust set of characteristics and use these to define subduction-related batholiths. These characteristics should include a combination of geographic extent (how many km long and wide? ), magmatic geochemical characteristics (e.g., K and isotopic gradients, and position relative to where the forearc basin and trench were (inferred from ophiolites, blueschists, and subduction-related eclogites), temporal features (subduction zones and thus magmatic arcs should be active for tens to hundreds of millions of years), and of course igneous rock compositions. I continue to look for ways to interrogate the rock record for information about WDPTS? This investigation should be as broad as possible. I recently co-authored a Geology paper on the topic Plate Tectonic Gemstones (Stern et al., in press), which identified gemstones that are diagnostic of plate tectonic processes of subduction and collision. The subduction gemstone is Jade, which consists of nephrite (amphibole) and jadeite (pyroxene). Nephrite can form in other tectonic environments but jadeite only forms 25-70 km deep (0.8 – 2 GPa) under the cool (300-500°C) conditions found in subduction zones. All 19 known localities of jadeite are Phanerozoic in age (Fig. 1). The collision gemstone is ruby, which is gem corundum containing ~1% Cr2O3, an impurity that gives the gemstone its deep red color. Rubies form by hot metamorphism (500°- 800°C, 0.2 – 1.0 GPa), especially when passive margin sediments (esp. aluminous shales) get involved in continental collision. We summarized 32 ruby deposits and all but two are Neoproterozoic (Fig. 1). These gemstones are particularly useful because they form so deeply that erosion should reveal, not remove these. Our understanding of the global distribution of the gemstones ruby and jadeite are further indicators that subduction and collision – and therefore plate tectonics – are geologically young phenomena. There should also be a way to use the temporal distribution of certain ore deposits to answer the question WDPTS? We haven’t made much progress in this aspect yet, but maybe someone will figure something out about this record. A while back I thought that porphyry copper deposits, which are clearly related to subduction, might be ‘smoking guns’ but now I understand that erosion is likely to remove all evidence of these deposits after a few tens of millions of years. By now you have probably reached a point where you either think that there is some merit in these digital scribblings, or you may have concluded that I am full of unlithified coprolites. Regardless of what you think about WDPTS?, it must have begun at some time after Earth formed. I have shared my opinion about when this was, and some of the reasons for this opinion. Whenever “the great tectonic revolution” happened, there must have been a different tectonic style that it replaced. What was Earth’s pre-plate tectonic style? To better understand Earth’s early tectonic style we must start from first principles. We know that the farther we go back in time, the hotter Earth’s mantle must have been. The lithosphere must have been correspondingly thinner and weaker and the asthenosphere must have been weaker and melted more extensively. Abundant mafic outpourings have loaded weak lithosphere, depressing it into the eclogite stability field (T>580°C, P>1.3 GPa) where the increase in density due to eclogitization would have stimulated further sinking, ultimately forming detached sinking diapirs, much as happens today during delamination. Archean greenstone belts must have been dominated by downwellings where weak lower crust delaminated and sank. The downwelling zones must have been flanked by mantle upwelling zones (Fig. 3). Hamilton (2007) concluded that dense mafic and ultramafic lavas erupted atop mobile felsic crust during the Archean produced a density inversion that led to the downfolding of volcanic rocks at the same time as domes of felsic middle crust flowed up and around the keel, resulting in the characteristic (keel-and-dome) structure of Archean greenstone belts. The lower panel on Fig. 3 summarizes one idea of what may have happened in the mostly “weak lithosphere vertical tectonics” of the early Earth. modern scenarios of delamination or “drip tectonics”. OK, enough ramblings. This brief essay has hopefully stimulated the reader’s interest in the grand question of when Earth’s modern tectonic regime was established. I encourage the reader to join the fun and excitement of this investigation. It’s easy to join and contribute to the discussion; we are just feeling our way around this problem. One route forward is to identify those rocks that, in your opinion, most likely formed by plate tectonic processes, and make these your “smoking guns” for plate tectonics. The occurrence of these through time may be an important indicator. It will also be fun to watch how this line of inquiry evolves and what new ideas are advanced over the next few years. *’The term “smoking gun” was originally, and is still primarily, a reference to an object or fact that serves as conclusive evidence of a crime. In addition, its meaning has evolved in uses completely unrelated to criminal activity: for example, scientific evidence that is highly suggestive in favor of a particular hypothesis is sometimes called smoking gun evidence. Its name originally came from the idea of finding a smoking (i.e., very recently fired) gun on the person of a suspect wanted for shooting someone, which in that situation would be nearly unshakable proof of having committed the crime (from Wikipedia). Coleman, R.G., Lee, D.E., Beatty, L.B., and Brannock, W.W., 1965. Eclogites and Eclogites: Their Differences and Similarities. Bull. Geological Society America 76, 483-508. Gould, S. J. 1965. Is Uniformitarianism Necessary? American Journal of Science 263, 223-238. Stern, R.J. 2005. 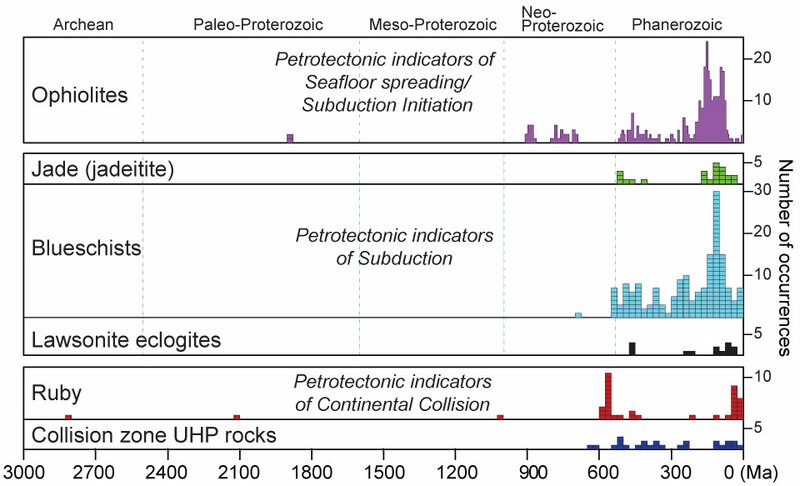 Evidence from Ophiolites, Blueschists, and Ultra-High Pressure Metamorphic Terranes that the Modern Episode of Subduction Tectonics Began in Neoproterozoic Time. Geology 33,7, 557-560. Stern, R.J. 2008. Modern-Style Plate Tectonics Began in Neoproterozoic Time: An Alternative Interpretation of Earth’s Tectonic History. Condie, K., and Pease, V., eds, When did Plate Tectonics Begin? : Geological Society of America Special Paper 440, 265-280. Tsujimori, T., Sisson, V.B., Liou, J.G., Harlow, G.E., and Sorensen, S.S., 2006, Very low-temperature record in subduction process: a Review of worldwide Lawsonite eclogites. Lithos, doi:10.1016/j.lithos.2006.03.054. The physical features of glacially placed jadeite in Ohio are identical to the formations of the entire ocean floor. Check out plate techtonics,mantle setting,jadeite.I was mis quoted previously,Edward S. Rader,former board of director Smithsonian was my mentor. I do not appreciate you calling people “religious nuts”. Even though you do not share in there believes but as a person who calms to know better you ought to respect others weather you agree with there views or not. it diminished the integrity, not of their faith, but of your work. He’s not calling all religious people nuts, just those who believe the earth is 6000 years old. If someone who denies every shred of scientific evidence available in order to rationalize a nonsensical belief in a young earth isn’t a nut…then I don’t know who is. 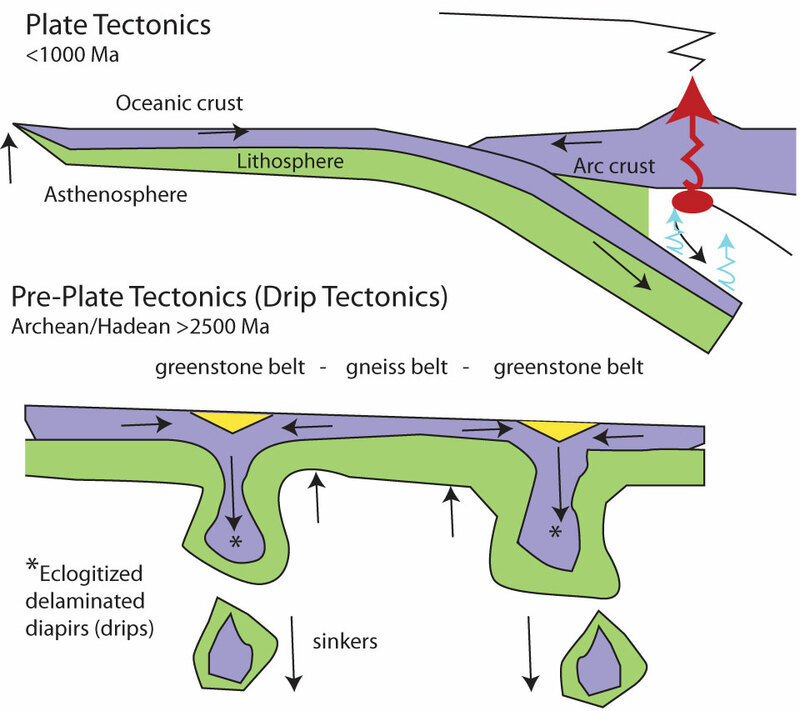 IMHO, Warren Hamilton, in his 2007 paper, “Earth’s first two billion years—The era of internally mobile crust”, and, even more so, in his 2011 paper, “Plate tectonics began in Neoproterozoic time, and plumes from deep mantle have never operated,” has made a very compelling case that plate tectonics did not, and indeed could not, begin until the Neoproterozoic, at the earliest. I found this quote, from Hamilton’s 2011 paper, particularly interesting and evocative: “Paleoproterozoic and Mesoproterozoic orogens formed from networked basins filled deeply by sedimentary and bimodal-volcanic rocks and then highly deformed and plutonized. The pre-plate tectonics concept of geosynclinal control of orogeny may have some applicability here.” I couldn’t agree more. Plate tectonics was certainly “a revolution in Earth science,” but in conceiving new hypothetical processes, especially subduction, to account for continental displacement, crustal deformation, magmatism, metamorphism, and mountain building, the Revolutionaries rather cavalierly dropped pre-PT geologists into a memory hole and cast their theories, such as geosynclines, into the dustbin of history. That is a real shame, because it has meant that the work of pre-PT geologists, such as the wonderful book “Geosynclines” (1965) by Jean Aubouin, which distilled the research and thinking of multiple generations of excellent geologists, whom, alas, lived and worked before The Revolution, is now largely ignored and indeed forgotten. Ideas such as “geosynclines” are no longer taught in undergrad or grad school, except maybe to demonstrate how far we’ve come since then. Geology is a historical science as much as it is a physico-chemical one, and yet modern geologists have chosen to forget the history of their own science and have thus become trapped in an intellectual straitjacket of their own making. Thanks Bill. Warren and I see pretty much eye-to-eye on this issue. Since every physical feature of glacially placed jadeite is a micro/macro identity to the earths mantle and the presence of a mono pole exists in both. Why not continue the thought into perpetual energy,magnetic north and south pole relationship. Possibly Mr. Edward S. Racer,former board of directors Smithsonian was correct 50 plus years ago. Now, for one of the most interesting and exciting topics Geology is yet to answer – How did plate tectonics, critical to Earth as we know it, commence? This very good article deserves to be read by anyone interested in Geology! Could this conversation be enlightened by how a supercontinent forms and then breaks up? I am new to this topic- not a geoanything- but I have been viewing and reading about the future Pangaea Ultima and Amasia supercontinents, and it struck me that the process of how a super-continent breaks up is not well explained. What happens to the subduction zones and mid ocean ridges that separated the continents? How do a new subduction zone and spreading ridges emerge within the supercontinent? Or are the components of a supercontinent not completely merged, much like bricks laid together in a wall? I am new to this so these questions might be unrelated to your discussion above. Yes, Hansen (2007) explores this. Probably impacts with sufficient energy to rupture the lithosphere only occurred early in Earth history. Hansen, V.L., 2007. Suduction origin on early Earth: a hypothesis. Earth Planet. Sci. Lett. 35, 1059-1062. I proposed this theory to my prof back in the eighties and I still think it holds water. I would disagree that they “ONLY occurred early in Earth history”, although they would of course have been much more likely earlier along the timeline (depending on your definition of when “early” was). I would love to get some full-time access to a super-computer cluster to run some models that go back in time based on the current movements of the plates to see if they agree with an impact event(s). I’m not a geologist, but after seeing the activity on a lava lake on Hawaii (the big island) it seems to me that that’s HOW subduction started, but it doesn’t “tell when”–and I doubt anyone will find old enough evidence surviving from the very early times–seems to me whatever evidence there may have been would have been reworked, metamorphosed, or eroded. Robert, at some point, someone has to put everything back on the table, and give a second thought to Carey’s theory. Subduction is logically mantle-driven, not lithosphere-driven as you believe, see for example that interesting paper by Le Pichon about the case of the Aegean Sea (Annu. Rev. Earth Planet. Sci. 2010. 38:323–51). This paper is flirting with the mantle-driven subduction hypothesis. Now, if we accept that subduction is driven by mantle expansion, they we go straight back to Carey… Wonderful time ahead for geosciences, for sure! As a layman, I would not rely on “smoking gun” rocks if early conditions were not favorable to their formation. So my question is what rocks would form in the high T/low P environment of early earth and have any of these been identified in older formations? Good line of inquiry. We know what kinds of rocks plate tectonics forms today, for example blueschists. The question is whether plate tectonics in an earlier earth would have also produced for example blueschists or something else. I think the former because yes the earlier earth would have had a somewhat hotter interior but the thermal regime of a subduction zone mostly reflects conductive cooling of the downgoing plate which is mostly controlled by the age of the subducting plate and the rate at which this is injected into the mantle. So the P-T conditions responsible for forming blueschists probably existed in an earlier, hotter Earth IF there was plate tectonics, IMHO. only question is, how long is the radiation heat gonna last? How distracting it is to see reference to “religious nuts.” Even if you don’t agree with their view of the formation of the earth, and even if their theories do not agree with the geological proof, to call them “nuts” is unnecessary. Actually, it is necessary. If we keep placating these people who believe in this ridiculous religious 6,000 year-old earth nonsense it looks like we are saying that it could have actually happened that way… much like the holocaust deniers, only in reverse. Wouldn’t you call someone nuts who didn’t believe in that? I think most people would use harsher terms. Bob Chaplin says: Commercially valuable gem-quality diamonds seem to occur only in association with transcratonic corridors in the upper mantle that extend over distances of several hundred to a few thousand kilometers Clusters of kimberlitic -type pipes and dikes are found at intervals of one to a few hundred kilometers along these “corridors of hope” , but most clusters are uneconomic.since the diamond is genetically related to the mantle and not the intrusive pipe. Only one or two percent of a “cratonic area ” is host to a high- probability economic discovery opportunity . The trick toward discovery is to locate these diamond-friendly clusters at low cost in time and money ,based on surface or near-surface mantle-derived information . Research has lead to a new prospecting method which is currently being applied with apparent success in Canada , done at a small fraction of the cost of current grass root techniques, and has worldwide application. “A while back I thought that porphyry copper deposits, which are clearly related to subduction”. Hey, Bob, porphyry copper deposit can also related to continental collision. In Tibet, Pakistan and Iran, many porphyry Cu deposits formed at c. 10 Ma. I would say that porphyry cu deposit can from in the whole process of an orogenesis. And the oldest porphyry cu deposit is also much older than 1.0Ga. See reviews by Sinclair, (2007), Porphyry deposits. Most of the geological community agrees that PT began around 3 Ga and was widespread on the planet by 2.7 Ga–there are numerous lines of evidence to support this, none of which did Bob mention. The blueschist, ophiolite, UHP metamorphism issue can be explained in other ways without calling upon the onset of PT at 700 Ma. More than likely, the preservation of these last 3 associations increased dramatically as orogens evolved from hot to cool types as pointed out in numerous papers by T. Gerya and his research group at the University of Zurich. It’s worth noting that Kent Condie and Victoria Pease’s book, When Did Plate Tectonics Begin on Planet Earth, is available in the iTunes bookstore at https://itunes.apple.com/us/book/when-did-plate-tectonics-begin/id634896354?mt=11. Check it out for more info on the subject. Kent captures the essence of the controversy, thanks Kent!